Do you have an interlocking paver driveway? Then you understand my frustration. Do you have a brick patio? Then you can feel my pain. Weeds. The little SOBs are pervasive and persistent. We were fortunate enough to buy a house with an interlocking brick driveway. A great feature for any home. But, often I would find myself envying neighbours with asphalt driveways. They weren't out there for hours on the weekend weeding their driveway. About once a year I'd get fed up with the weeds and sit on the driveway and weed until my hands throbbed. I'd feel satisfied with my hard work, until less than a week later the weeds returned with a vengeance. They wanted revenge. So, as you can see so clearly in the Before shot above, I'd give up. The weed gangsters could loiter as they pleased in our driveway. We'd avert our eyes and mind our own business. Ed would run the mower over the driveway when he did the lawn. I'd park the van in such a way to hide the worst of them. Four years ago, after we renovated, we needed to build a new walkway to our front door. It was then we discovered this product. I describe it as sand that glues itself together and makes no room for weeds to infiltrate. We used this product on our walkway and have had little to no problem with weeds. We needed to use this to take our driveway back from the weed mob. Our driveway, it was an eyesore. We had full intentions of tearing it all up this summer, levelling the bed and relaying the bricks. We had blocked off some time for this. Summer rolled along. Time grew short and we started to realize that the time we had for it was likely not enough to get it all done. Robin devised a plan whereby we remove the weeds and sand and re-lay new, polymeric sand without actually moving the bricks. Genius! But could it be done on time and without us dying of sunstroke? Just Brutal. Here is what we did, in the order we did it. At the end, I have a suggested sequence that I would likely do if we had to try it again. NEW! ⇒ If a Video Tutorial is more your style - scroll down - we've got a video there for you! 1. Used an edging tool to find and cut the driveway edge. Pulled up the clumps of grass and tossed them in the composter. 2. Rented a 36" Sweepster for the day. We lowered the brush as low as it would go and swept back and forth, up and down over a dozen times each way. It was crazy hot and dry and it made the area very dusty, but it cleared most of the sand out of the accessible joints (see step 2 for what made a lot of the area inaccessible). 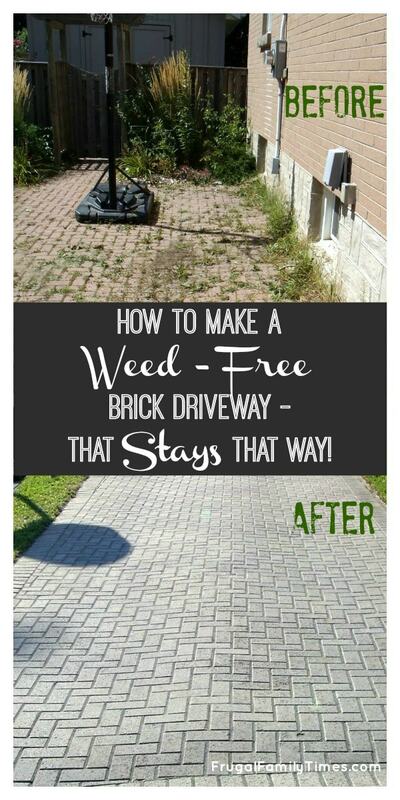 It was perfect for getting weeds out from between bricks. We used, and broke three. We found tHE BEST tool to pull weeds from CRACKs in PATIOS AND DRIVEWAYS - WE REVIEWED the top 3. The Sweepster was a rock star at removing the existing sand/brick dust mixture, but wherever a weed had dug its roots in, there were issues. And you saw how many weeds there were, right? Anyhow, we hack attacked the cracks for the better part of 4+ hours in the afternoon. We have no pictures of this, as we were worried that if either one of us stopped, we would never start again. It sucked. No, really, it did. After shot of weeded and Sweepstered (sp?) driveway. It is tough to see, but most joints have 1"+ of sand removed. 4. ReSweepstered the weeded driveway to take care of all the last bits. 5. Polymeric Sand the Joints. Our NEW video shows how we did this. I also used a shop-vac on blower setting in place of the leaf blower and silent swearing in place of helpful narration. We guesstimated the number of bags to buy, based on square footage in our driveway, minus the fact that we were only topping up, plus the fact that most estimates are based on larger pavers (fewer joints per square foot) vs bricks. We ended up buying 3 bags too many but are keeping them for future projects (and have already used one on a back walkway). If you have never used Polymeric Sand, it is a wonderful product. On new construction, if you follow all the steps in the video, you are buying yourself 4-5 years of completely maintenance free patio/walkway. Even after that time frame, the weeding and upkeep are much less than regular sand, which means less time/ nasty sprays will have to be employed. I didn't do as thorough a job as I should have when blowing, so some haze is evident in some areas. I have decided to call those spots, "extra traction zones" for winter. You can't argue the improvement in appearance, though. We're very happy and total time was a little over 2 days versus the unrealistic week we thought we could tear the whole thing up and re-lay it in. Weed everything thoroughly first - we thought the sweepster would tackle the weeds better than it did. Finish as above with polymeric. Plus this update we did 6 years later! Four years ago, after we did our walkway, our neighbour called around to see if she could get her sand driveway converted to polymeric sand. She was given a quote of $4,000! Her driveway is a similar size to ours. So we figure we've saved ourselves thousands by doing two days of hard work. Anyways, like I said, we're happy for now and our neighbours can make eye contact with us again. 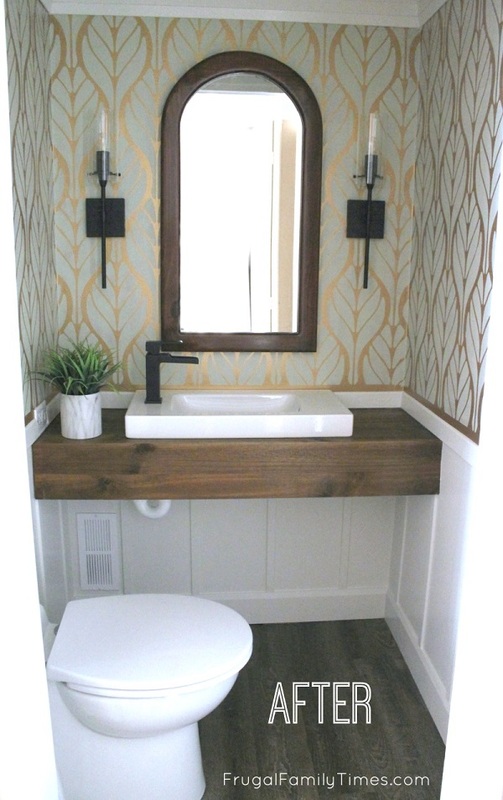 Have you had any projects where you scaled them back and were still happy with the results? Any questions we can help you with? An update for 2018! 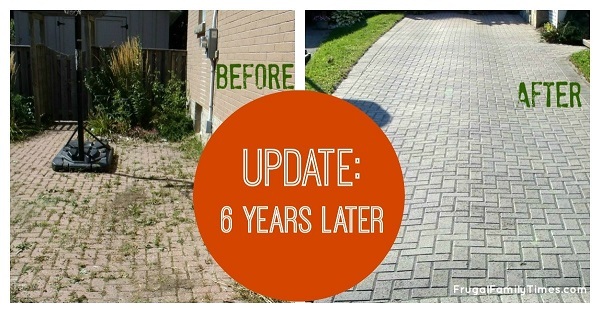 Click here to learn how our driveway held up 6 years later - and the mistake we made that you DON'T want to! Want to know how to have a weed-free vegetable garden? We've got that answer, too! Looks like all the hard work paid off! Yes! Meaghan, we are so very happy with it. The brick driveway looks like a feature again, instead of an eyesore. Glad you stopped by. Thanks for your comment! Can you guys post a photo of what the driveway looks like today? boiling water kills weeds too! Agreed! But on some scales, like our huge driveway, thats a LOT of kettles of water. Great tip for a small area though. Do you guys suggest use of it? If yes, then which model do you guys prefer? I was thinking of using my shop vac to vacuum up the sand. I just tried sucking out sand with a shopvac and got minimal results. The pressure washer idea might work better. Thanks for the great article! While far from an expert, I'll try my best to help with your question. We're big fans of Polymeric sand for filling the small gaps and preventing weeds from creeping up. While it does act as a binding agent between the bricks, it sounds like what you are needing might be more than it can handle. Your driveway may need a rebuild and leveling on the retaining wall side. When that is done, the polymeric sand would definitely help keep runoff from getting between the bricks and the water would shed away more completely, possibly keeping it in good shape for longer. Sorry I'm not more help, but thanks for the question anyway. All the best with your brick driveway. Just read this article after doing our driveway this weekend, the pressure washer works really well but a word of caution it makes a huge mess, I was covered in mud and got dirt everywhere make sure you use old clothes. 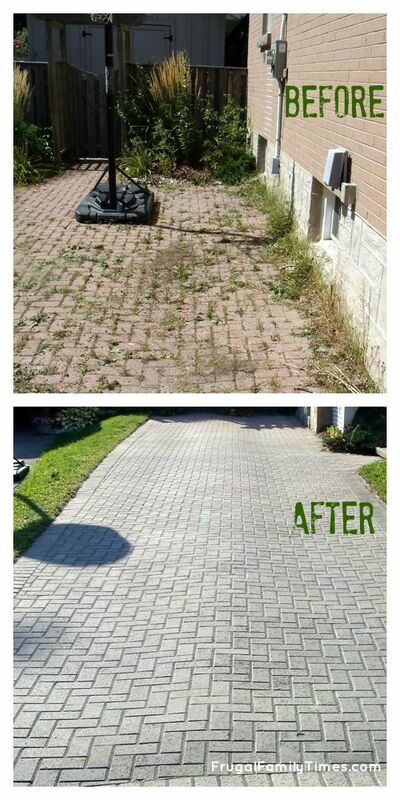 If you do a good job with the polymeric sand it keeps the weeds out for years. We did our front path 5 years ago and it is still almost perfect. We pull maybe 3 weeds a year from it now! Where did you buy the garden knife? Hey great article but here is another idea. You can use a gas trimmer and put the head of the machine on an angle and it does a great job in getting weeds out from the cracks. Oh Robin and Ed I am so happy to have found this post! We bought a house with bit only a brick driveway, but brick paving entertaining area (which is huge) and brick walk ways and pavers around the pool and back of the house. The job is going to be huge. (Luckily minimal weeds in the entertainment area section) But the rest is a nightmare to maintain. We have been looking at this product to use, so glad I read your experience first so we get it right first time! It looks great. Hope it works just as well for us! Thanks - we hope you still thank us after the job (or during - it can be messy, hateful work). The Polymeric Sand has held up well - the best follow-up advice I can add is to try and get down as deep as possible in the grooves. The only spots we are currently fighting weeds are in areas that we didn't clean out as vigilantly as we could. Yes - that gray haze goes away - with a bit of traffic and some weather it was gone by the end of the summer. What about the combination of vinegar, salt, and detergent? I've used that a few times and it looks like it kills the weeds. Just don't know how permanent. You'd think for a good long while with the salt. where did you buy the Polymeric sand??? could you please add links it would be so much easier for people.. and what a fantastic transformation. I got mine at Home Depot for $17 a bag. You can probably get it at Canadian Tire or other garden centres as well. Just spent my morning crack attacking weeds and pressure washing away years of moss and buildup. Tomorrow I apply the polymeric sand but holy crow, what a difference already!! Thanks so much for your tutorial!! We have a large patio with colonial style bricks that were put in with sand approx 10 years ago, and they are overtaken by weeds. Our landscaper wouldn't even quote us redoing the patio (including regrading away from the house) because he said at about $10k... you have much better things to do with that money! So I think once we're moved in completely and projects are lessening... we'll take this approach. Thanks! Is this brick driveway still permeable? We put in one a few years ago precisely to have a permeable surface that continues to allow water to seep down instead of running off. Would that new sand prevent this? Great post! I m surely sharing this with my friends! I had the same problem and usef the same special sand. Sand colour not grey sand... Anyway i used a high pressure water cleaner to clean the weeds and dirt out. And used a flat edged shovel to move the breaks slightly further apart by digging in the gap between the stones and push back and forth a small gap to allow the special sand more space. It toke me 9 years of weeding before i got pissed off with it lol. Glad i did tho. I had the same problem and a gas leaf blower is my solution. Thank you for this great information. You gave me the courage to fight these horrible weeds that are growing ferouciously allover my front driveways and paths. Now just waitting for the last snow storm to melt and I'm at it! Any updated pictures on how the driveway looks today? Is it still holding up? Awwwwwwwww, the weed always grow quickly and make my garden look ugly....i need to spend more time to cut off all of them, thanks for sharing your ideas !!!! Wow, it look like your hard work paid of. Saved thousands, your results is gorgeous , and you can pat yourselves on your shoulders each time you look at your beautiful work. Thank you so much for sharing. Your driveway look like specialist did it. Niceeee! Can I share it on my facebook? The garden knife sounds like a good idea to get the stuff out from between the bricks, but I saw a tool some years back ... a pole with something like a thin nail in the end to do the digging out. Since I am a senior, I can't bend the way I used to. Any know whee I can get one of these beasties? OMG weeds, I am so scared of them. Wish that I could make them disappear from my brick wall forever. Are you still weed free? I think maybe the reason for suggesting the plate compactor would be the fact that it vibrates over the bricks and actually "rattles" the sand further down into the joints, thereby increasing the depth of the sand in the joint. Did you seal the pavers again after you did the sand work? Or should you seal the pavers first, and then use the sand? Mate! Sidewalk where I live have no grass like this, so this is the first time I know this device. It is wonderful! this is a great guide, thanks. I’m impressed, I must say. Really rarely do I encounter a blog that’s both educative and entertaining, and let me tell you, you have hit the nail on the head. Your idea is outstanding; the issue is something that not enough people are speaking intelligently about. Wow great idea. I want to try it. I did complete this types work by pressure washer. Now i got the new idea that I didn't really know. Thanks Robin for your efforts! Keep up the good work. Omg, omg, omg!!! You can't even imagine how happy I am to have found your post!! Everything you said is exactly what I feel. Those damn pave stones are gonna have my skin before I turn 40!! Thanks so much, i am DEFINITELY doing this next week-end! Yaaaassssss! This is really interesting and I am thinking to give it a shot. But will it work for really, really rainy places like Ireland? Wow! What a difference! When you compare your results to a quote of $4,000 then 4 hours of hard work and a few hundred dollars seems totally worth it. It WAS worth it, David! Makes for much less creepy curb appeal. :) thanks for your comment! outstanding description. Thanks a lot. One suggestion, albeit a bit costly, is to pre-spray with a weed killer, e.g., Roundup and wait a week or so. Getting the weeds out thereafter should be a breeze after the roots have died. As for the rainy periods post work, one can always use a water proof nylon / tarp. Very good description of the work required Robin, pretty much the same as we did a couple of years ago. Unfortunately we weren't aware of the Polymeric sand - so we are now considering redoing it all again as the weeds are back with a vengeance. Further up the thread someone asked about re vibrating the sand into the joints. Not a practice I would recommend. With about an inch or less of sand removed between the joints the blocks still have over 60% of the original 'strengthening' between them. Applying vibration to the blocks, post refurbishment, presents a real risk of cracking the blocks - and that can be real frustrating. Probably the most well-known of all weeds, the humble dandelion is actually bursting with vitamins A, B, C, and D, as well as minerals such as iron, potassium, and zinc. The great news is that there’s probably a ton of this nutritious weed in your backyard. Dandelion has been used throughout history to treat everything from liver problems and kidney disease to heartburn and appendicitis. Today, it is mainly used as a diuretic, appetite stimulant and for the liver and gallbladder. Every part of this common weed is edible, from the roots to the blossoms. Use the leaves in sandwiches and stir fries – they boast more beta carotene than carrots, meaning they are great for healthy eyes! Roots can be made into a herbal tea, or roasted and ground as a coffee substitute. The sweet flower heads will add color to salads and can be used to make wines. Why Not Try: this Creamy Quesadilla Recipe with your Dandelion Greens? Part of the mustard family, this particular plant is considered an invasive species in North America. However, it brings with it a lot of great health benefits – aside from being a good source of vitamin A and C, Garlic Mustard is popular as a diuretic, helps with weight maintenance, improves heart health, lowers cholesterol and strengthens the immune system. Historically it was used to flavor salt fish but it’s also really flavorsome when mixed with mashed potatoes, soups or salads. Why Not Try: a Garlic Mustard Pesto or Mayonnaise? The truly versatile Elder is not exactly a weed but is quite a common wild tree, especially around rivers and lakes. The flowers can be collected in spring to make elderflower cordial, soda or champagne. With a refreshing, mild taste, they’re great when paired with apple or pear. Dry the flowers in bunches to make a tea. Once the flowers on the tree die off, the green berries can be picked (before they ripen) and pickled to make elderberry capers. Make sure to leave some, as the ripened berries make a delicious balsamic vinegar. The leaves, flowers, fruits, and root extracts are used by herbalists to treat bronchitis, cough, colds, flu and fever. Studies have shown that the wild plant is effective in treating influenza. Why Not Try: a classic Elderflower Cordial? This rapidly growing summer weed produces black seeds which are related to the protein-rich superfood quinoa. Much like their cousin, the seeds of lamb’s quarters are a great source of protein, along with providing vitamin A, calcium, phosphorus, and potassium. Harvesting these seeds does take a little dedication though! If that seems like too much work, don’t worry – you can also enjoy the young shoots and leaves of the plant. Whether raw or sautéed, they make a great replacement for spinach and are just as nutritious. Medicinally, a tea made from the leaves is said to help with digestion issues and stomach aches. It looks GORGEOUS! Great job! Can't wait to read the 6 year update next.